Perhaps the best of the dark flowering salvias, Salvia guaranitica ‘Black & Bloom’ is a development on the well known ‘Black & Blue’. 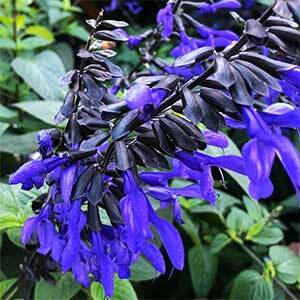 The deep blue flowers with black calyxes and black stems contrast well against the mid to deep green foliage. This is an easy care plant, in the garden or container and is a show stopper when in full flower. The foliage is scented with a distinct anise fragrance, this is accentuated when crushed or brushed against. Bees and nectar seeking birds are attracted to the garden. A reasonably tall growing variety, Salvia ‘Black & Bloom’ is best planted as a feature plant set a little way back in the garden border. With dark colours it can be used as a foil for brighter or lighter flowering perennials. Choose a sunny position with a little afternoon shade in very hot areas. Dig in good amounts of compost and aged cow or sheep manure before planting in poor soils. Mulch around the plant tp maintain a cool moist root run. Water during long dry periods over summer. Top dress with compost and aged manure after pruning back in winter. Simply prune back to ground level in winter after the foliage has died back a little. You can also prune away the spent flower heads during the growing season to promote more flowers.